After solving Escape Alcatraz Level 10, we will continue in this topic with Escape Alcatraz Level 11 , this game was developed by Great Puzzle Games a famous one known in puzzle games for ios and android devices. From Now on, you will have all the hints, cheats and needed answers to complete this puzzle.You will have in this game to find words from the tiles on the bottom of the screen by using the hint shown in the picture. 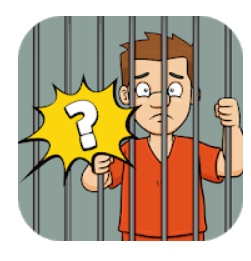 Escape Alcatraz is an addictive word game to help Peter break out from Alcatraz. Peter was sentenced to life imprisonment for murdering his wife. In fact, he didn’t do anything to hurt his wife. He is innocent, you need to help him survive and break out the prison. In prison, he met with a lot of difficulties, such as tortured by cellmate’s purr, molested by gay prisoners, survive during gangs fight, etc. There are also good things for him, e.g. flirting with the pretty doctor. On each level, you need to guess the word based the clue in the picture. Simply click to type the answer to finish the level. After achieving this level, you can use the next topic to get the full list of needed words : Escape Alcatraz 12.